Week three started well with all three machines collecting data. 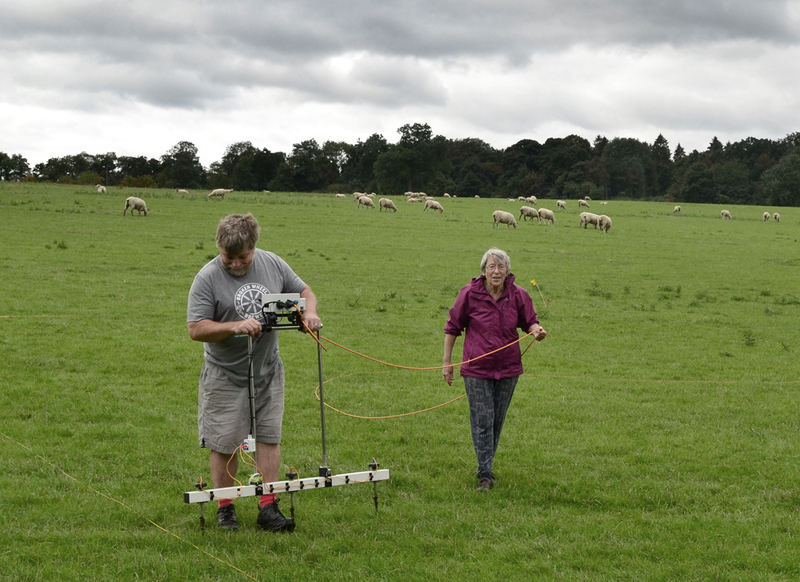 The Earth Resistance survey was the poor cousin as regards person-power but Ellen and I, helped by Rhian, completed three grid squares after lunch. Figure 1: Ellen and an earth resistance meter. 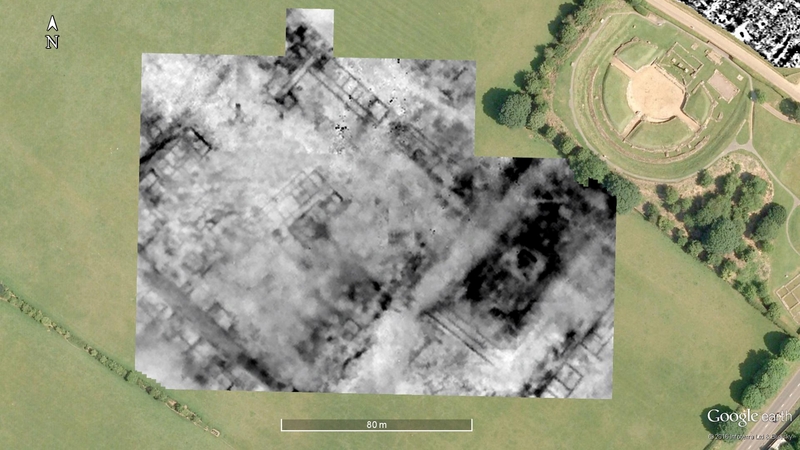 The grids are over the fascinating burnt building seen in the mag. 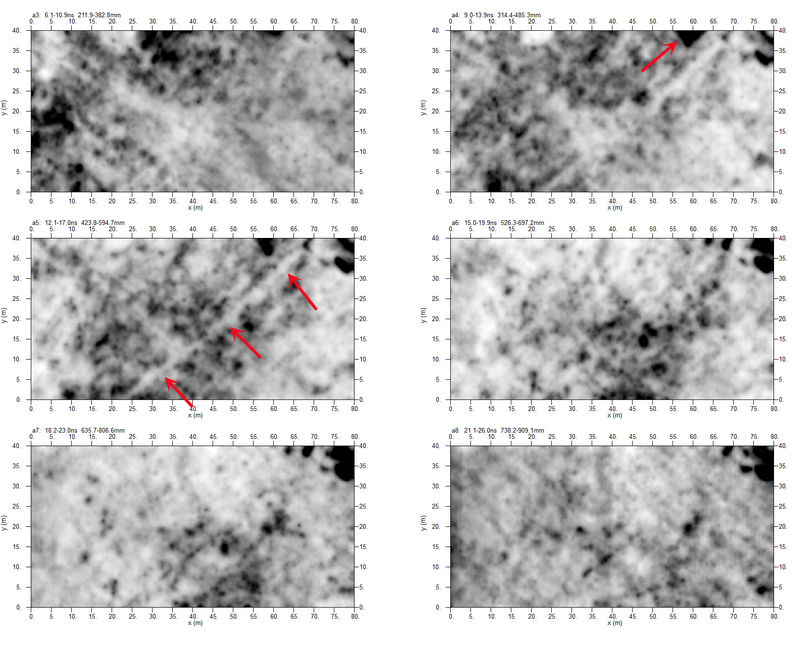 Figure 2 shows the mag data in this area. 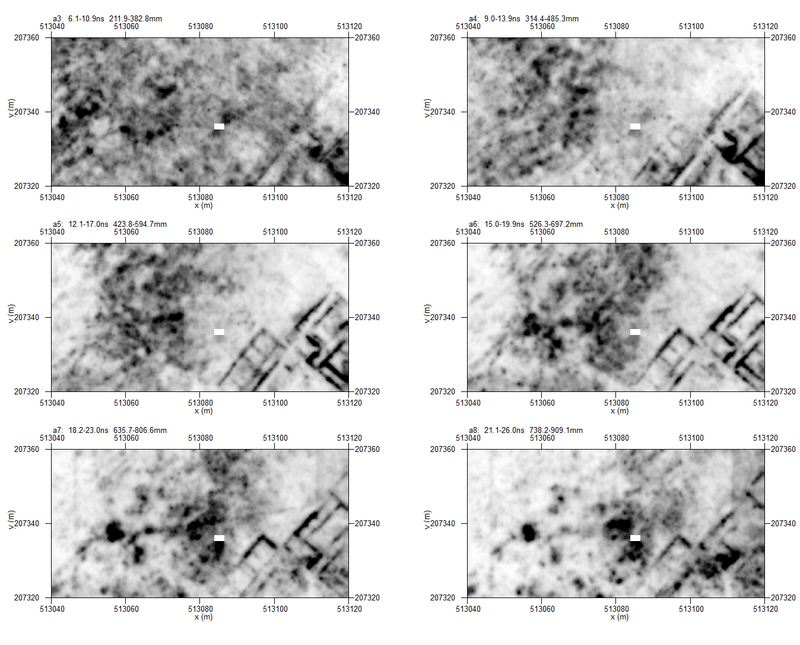 Figure 2: the mag data in the area of the res survey. 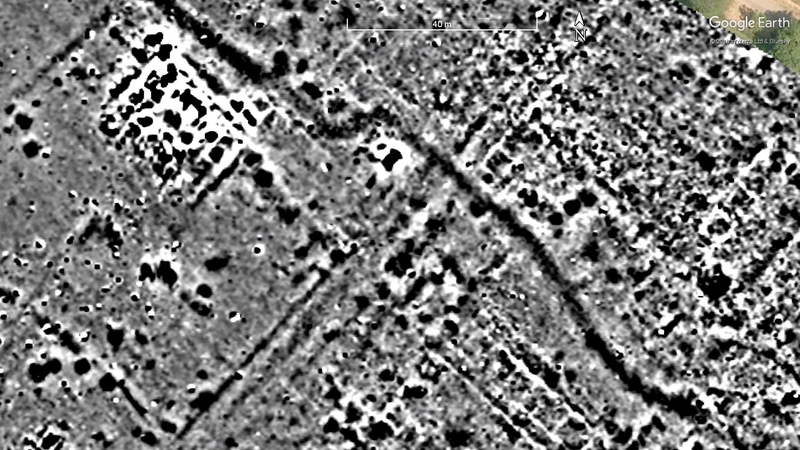 The black line snaking across Figure 2 from top-left to bottom-right is the aqueduct. 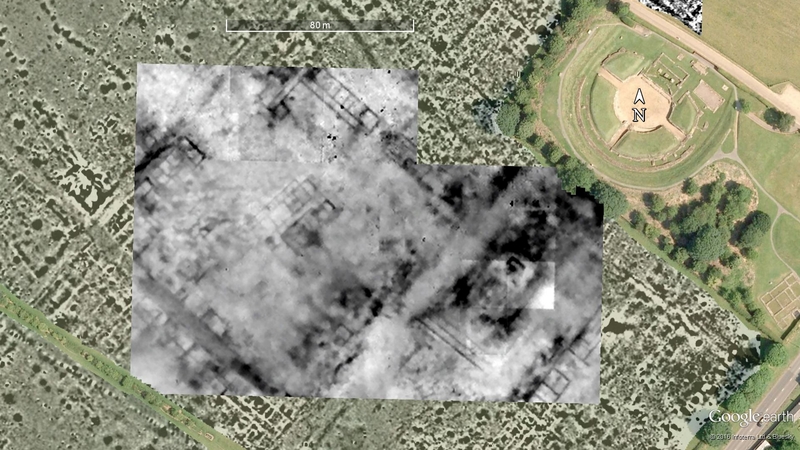 The very bright black-and-white area in the NW corner of that figure is probably a burnt building which was never replaced in stone. Figure 3 shows the Earth Resistance data. 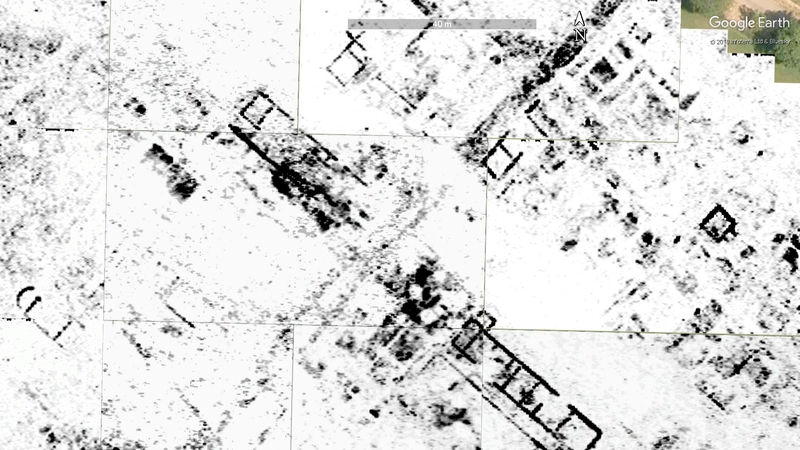 Figure 2: the Earth Resistance data. 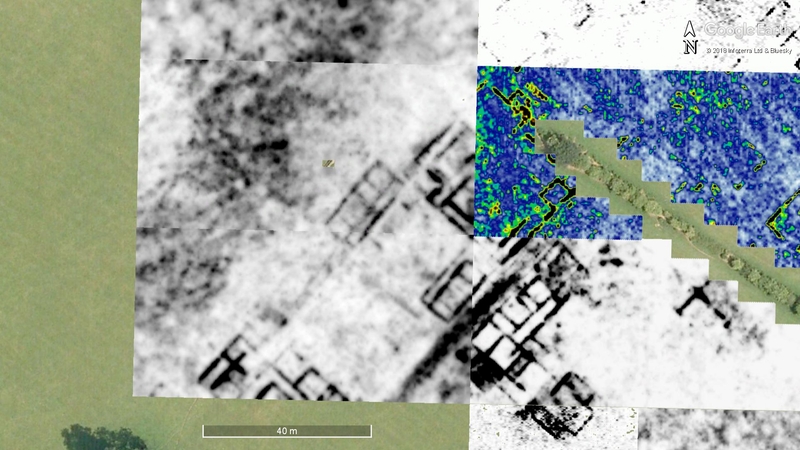 Figure 3 is a crude composite of the data collected in 2016, 2017 and 2018. The three squares at the north edge are this year’s grids. We have clearly picked-up a long wall running NW-SE, and some square areas of higher resistance (?floors, maybe). 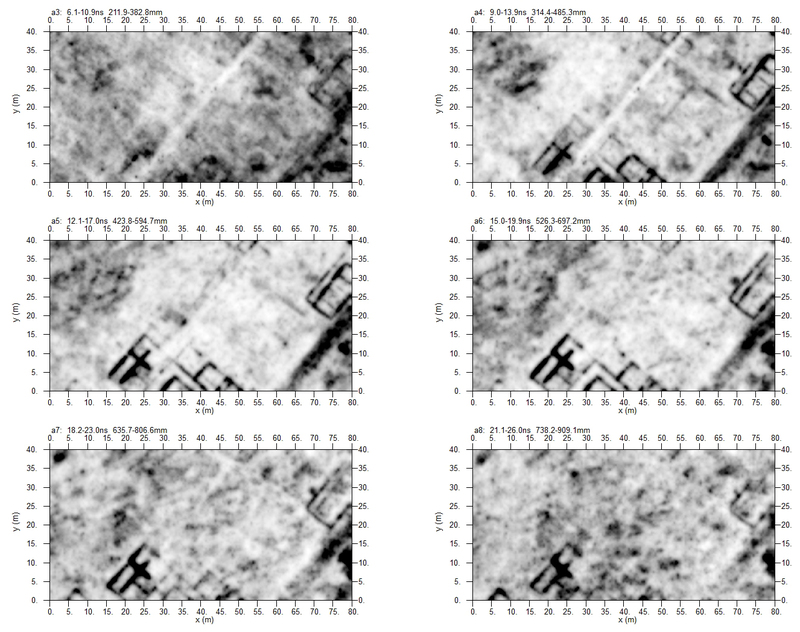 This survey makes an interesting comparison to the GPR in this area (Figure 4). 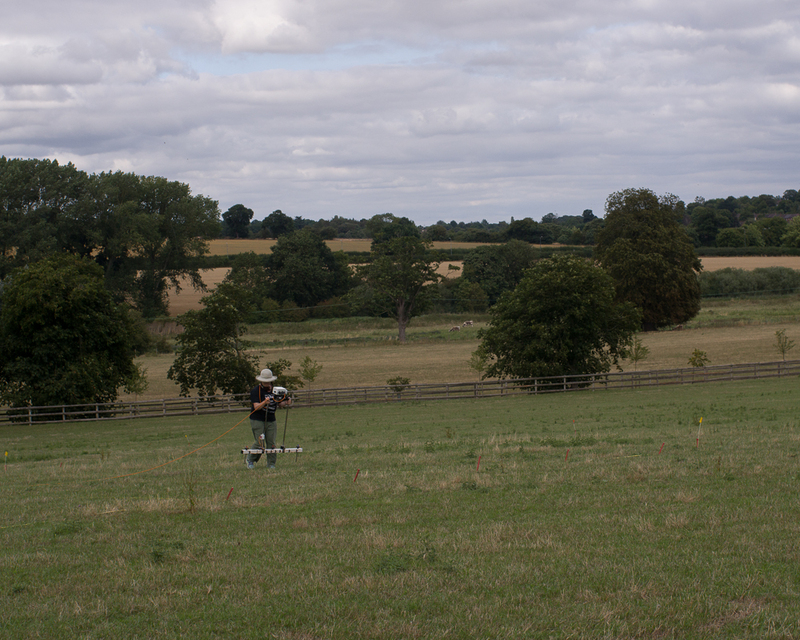 Figure 4: the GPR survey in the same area as Figures 1 and 2. There is a lot of work to do tracing off walls and features from the three surveys. The GPR crew completed another 80x40m block, although the slope was quite a challenge. Figure 5 shows the time slices. 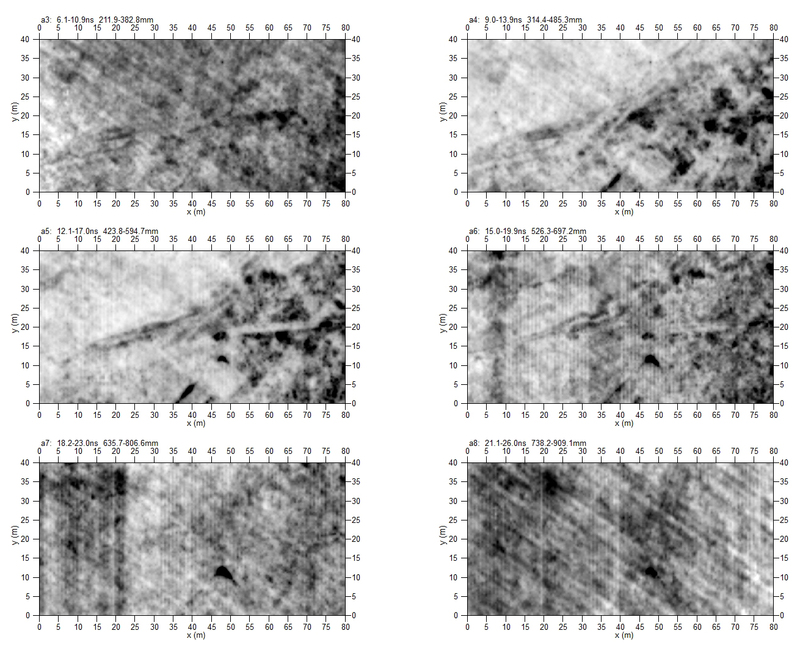 Figure 5: day 11 GPR time slices. Slices 4 and 5 (top-right and middle left) seem the most interesting. No stunningly clear buildings but lots going on. Figures 6 and 7 compare the fifth slice with the mag data. 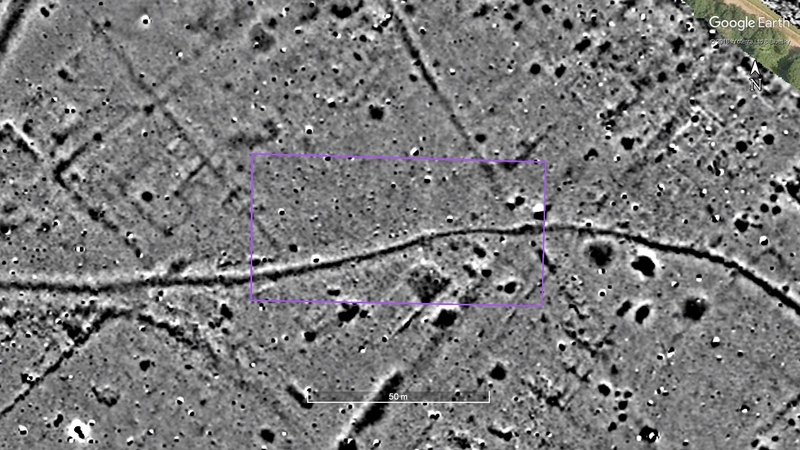 Figure 6: Fifth time slice from day 11 (indicated by the purple line). 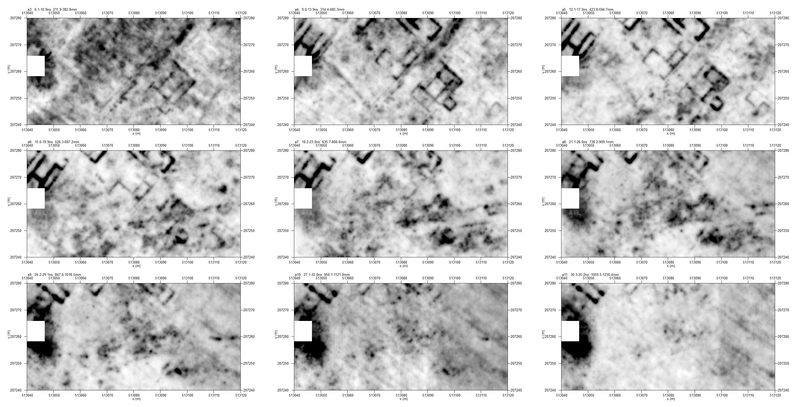 Figure 7: the mag data in the area of the day 11 GPR data (shown by the purple box). 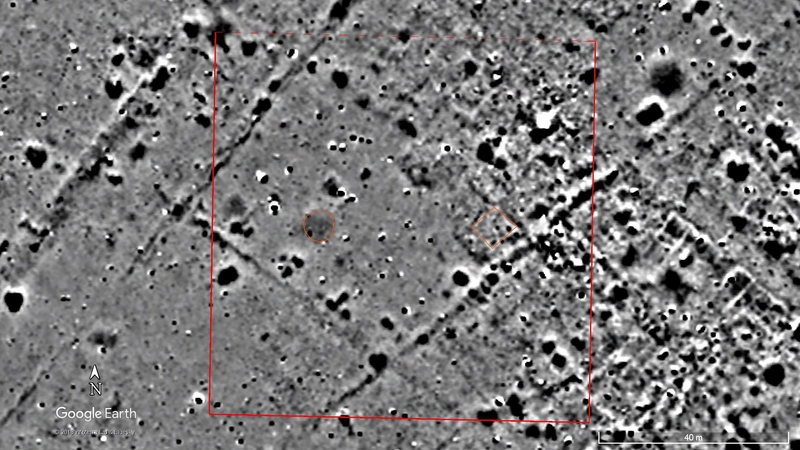 Notice how the square of higher mag response shown in darker tones towards the bottom of the purple rectangle are an area of light “low reflections” in the GPR data. It is possibly something like an earth floor? 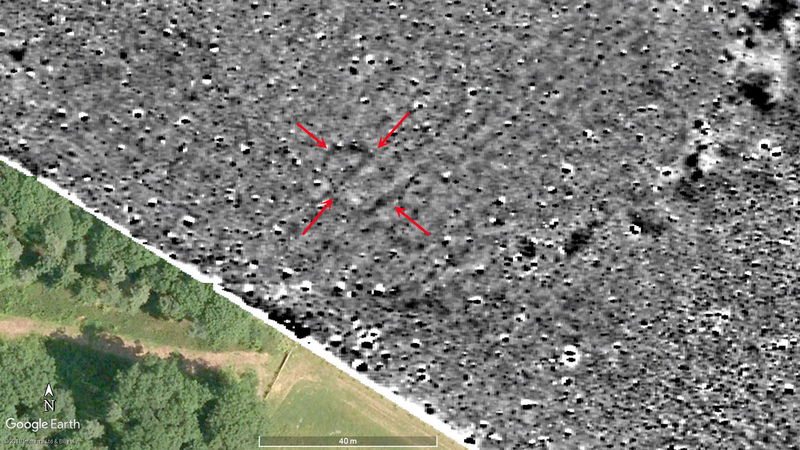 Off the west corner of that square in the mag data is a lighter coloured line running to the SW which is matched by a black line of high reflections in the GPR data. That is clearly a wall, probably made of flint. 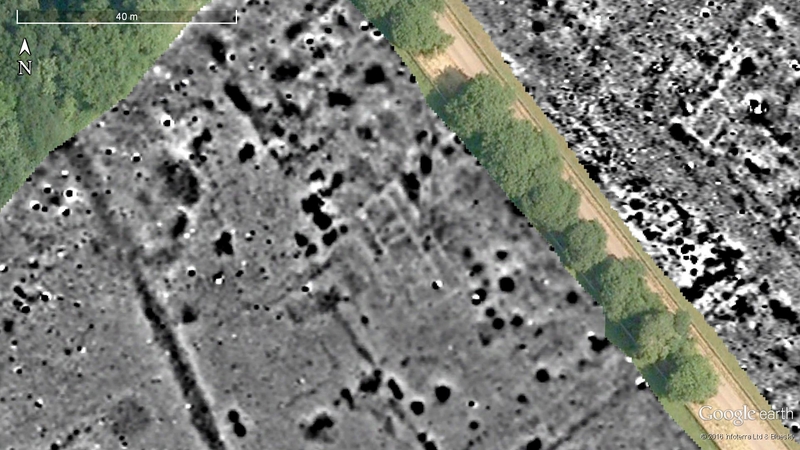 The very narrow section of the aqueduct which runs east-west across the plot shows very clearly in the GPR data whereas the broader sections do not. 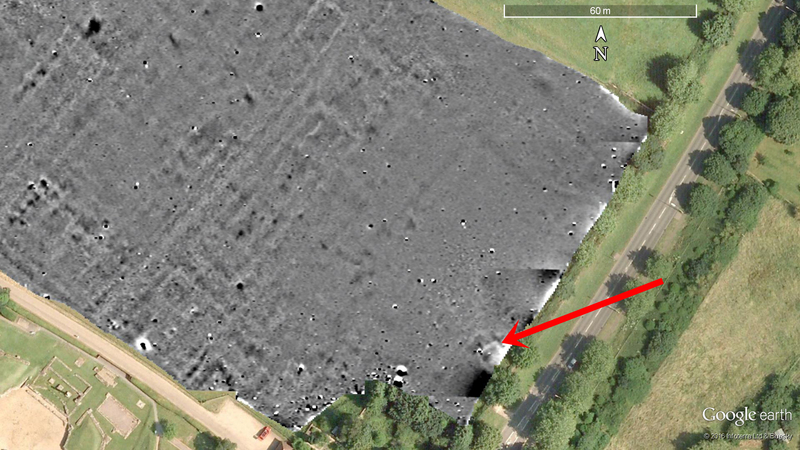 Something odd happens with the aqueduct at the eastern edge of the GPR plot. A great deal more to tease out. One problem we have had this year is the sheep. In general they keep away from us. The main issue is that some of them think the flags are tasty… (Figure 8). Figure 8: Tasty! A nibbled flag in Mobbs Hole with the mag crew in the background. The mag crew consisting of Jim West, Peter Alley and Dave Minty had three annoying partials to do before marching eastwards across the field. I’m afraid I have not finished processing those annoying squares but I have added in the complete ones to Figure 9 so you can see progress. 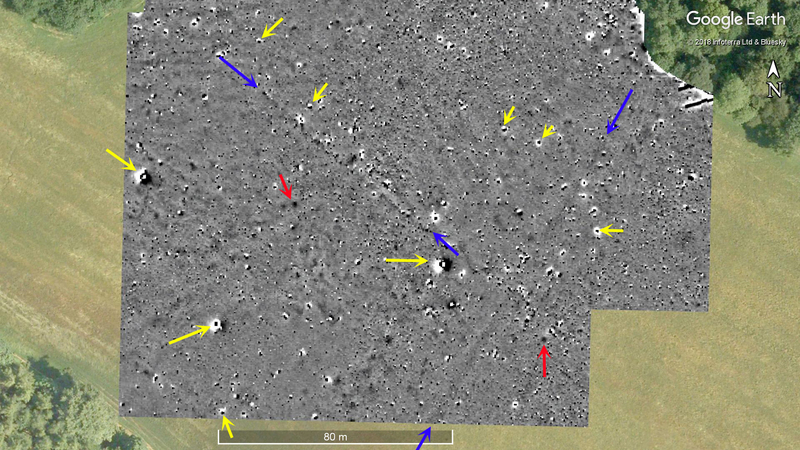 Figure 9: mag data in Mobbs Hole after day 11. Unfortunately, today was a bust as it rained 8.5mm. The forecast for tomorrow is looking good though. 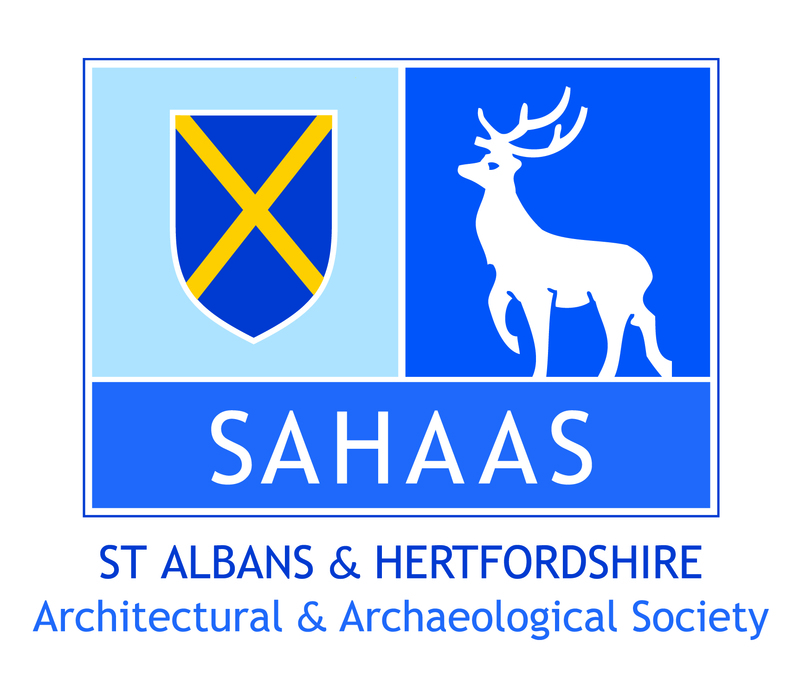 This entry was posted in Verulamium and tagged ahrc, CAGG, community archaeology, earth resistance survey, Gorhambury, GPR survey, Ground Penetrating Radar, Hertfordshire, magnetometer, magnetometry, magnetometry survey, Mala, resistance, Roman, Roman town, Roman urbanism, SEAHA, St Albans, ucl, urbanism, Verulamium on August 16, 2018 by hertsgeosurvey. I suppose I cannot really get away with that simple a post. 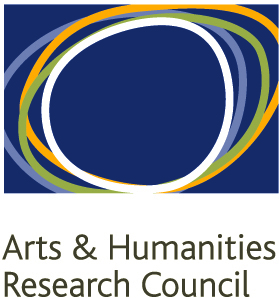 First of all, CONGRATULATIONS to everyone, it is a fantastic achievement and I am so proud of all of you. 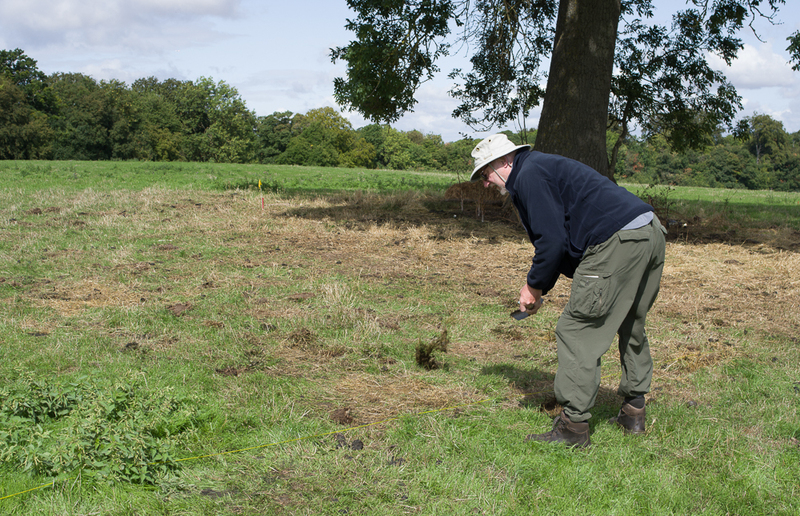 Secondly, a big thanks to everyone who turned out for an extra day on Bank Holiday Monday to complete the Macellum field. How about some numbers? 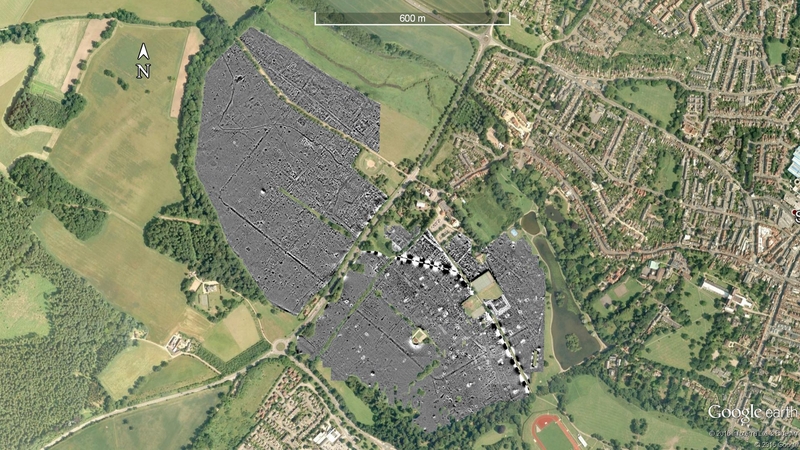 Well, Verulamium is the third biggest Roman town in Britain, after London and Cirencester. 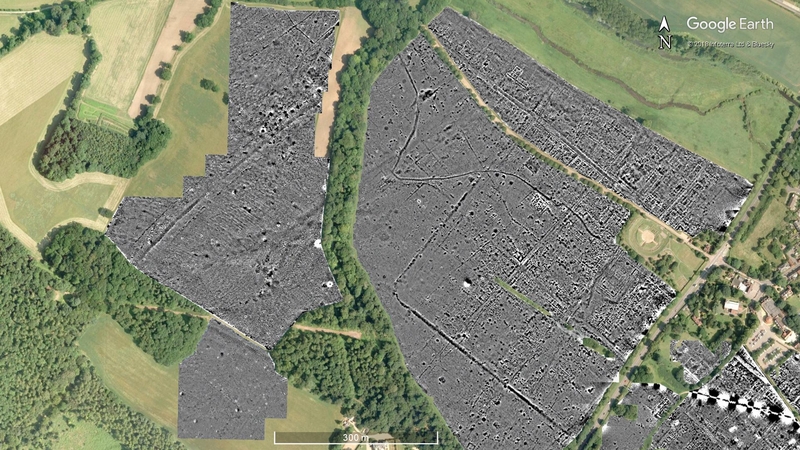 It is, however, the largest Roman town in Britain which doesn’t have a modern settlement built over most of it. 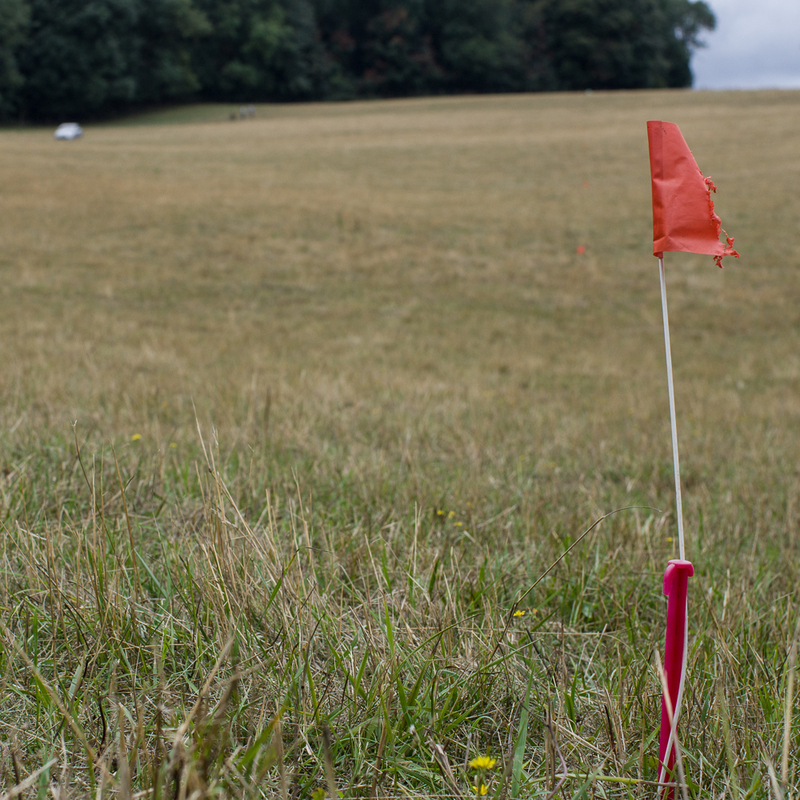 We have surveyed 64.5ha of the total area of 81ha. 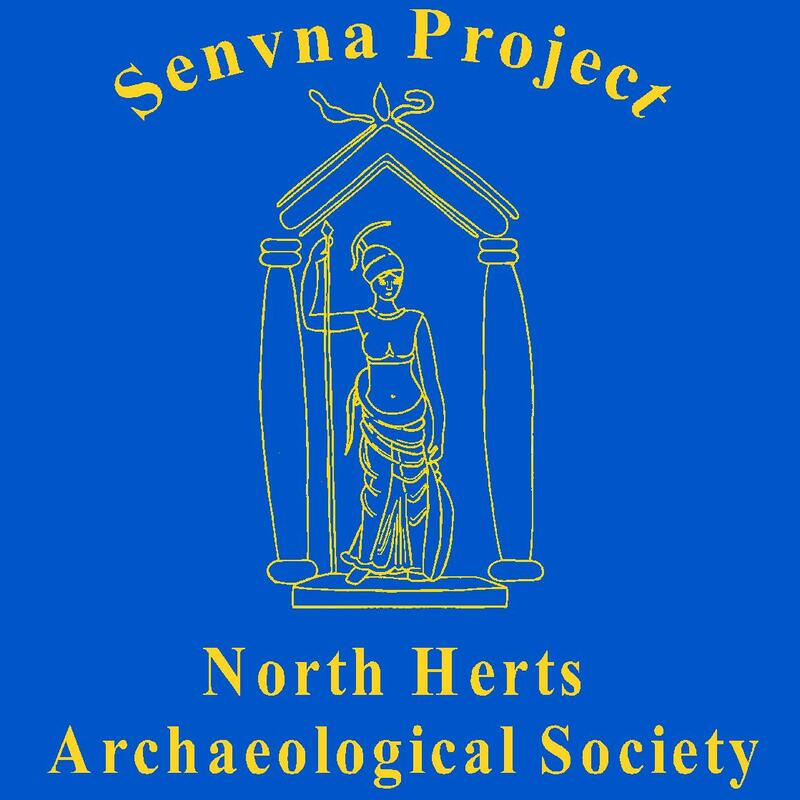 It has taken us 83 working days starting in the summer of 2013, but we didn’t do much at Verulamium in 2014. It took 12,900,400 readings to cover those 64.5 ha. That, of course, doesn’t include the grids we did twice because of frozen sensors or other problems. People pushing the cart walked about 322km, not including having to go back to the start for partials, getting to the squares in the first place, or laying in the tapes and strings. 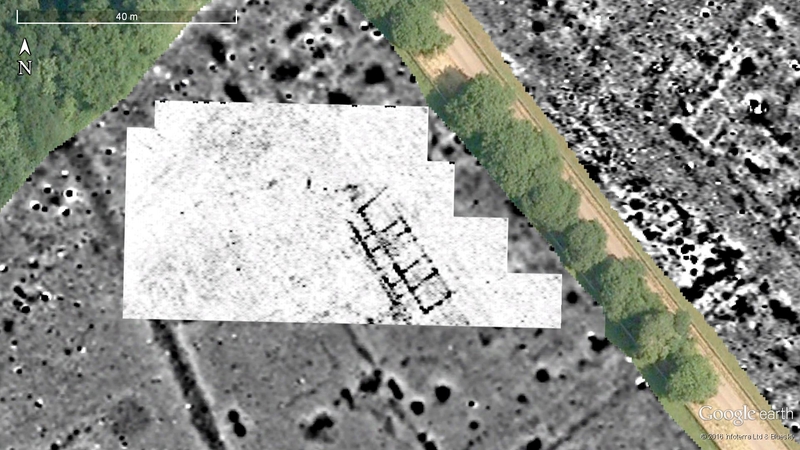 Let us look in more detail at the last bit surveyed in the Macellum Field. 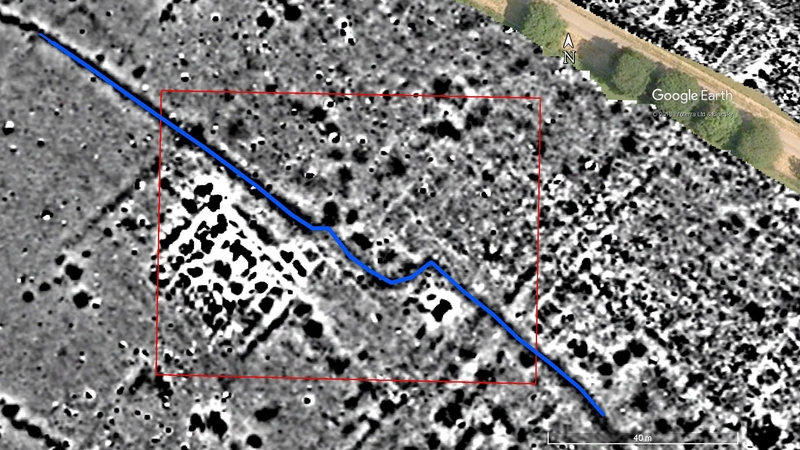 The area surveyed during day 37) high contrast). Several things come to mind. Firstly, there is very little there! 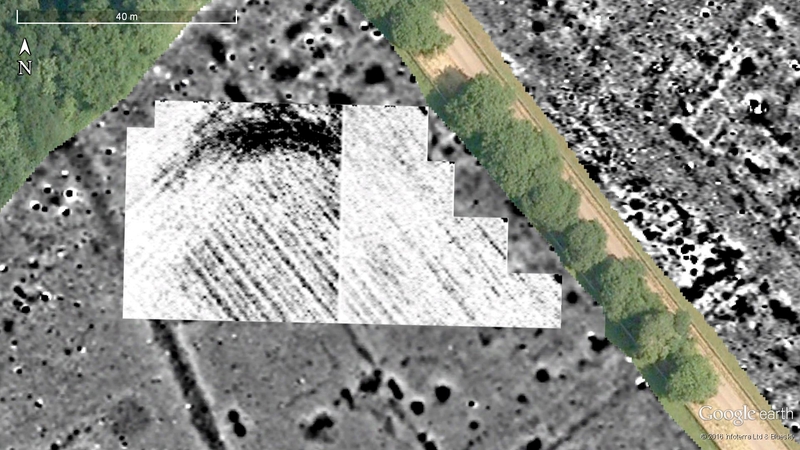 Towards the NE and along the western side there may be a ditch feature, although it is quite faint. Other than that, the main (and annoying) thing are the strong magnetic anomalies along the edge of the field. Some of you may remember the 12″ gas main which runs across the Park… well here it is again. What I do not entirely understand why there are differences between the negative and positive readings along our grid lines. 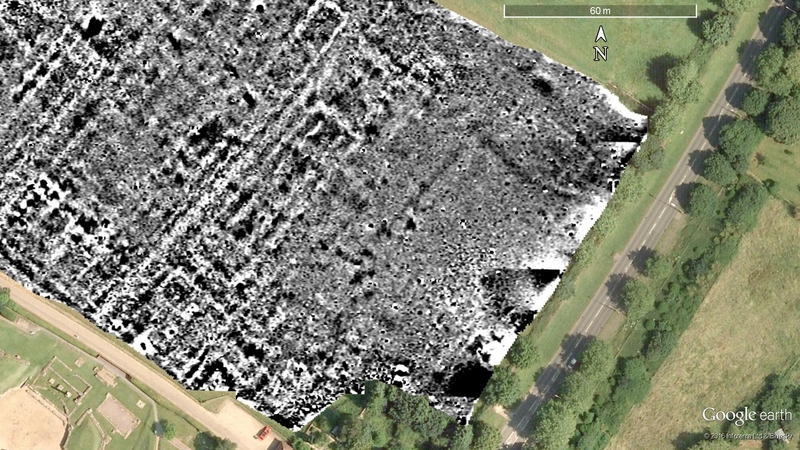 Jim and I spent some time making sure I put the composite together correctly, and we are sure it isn’t a survey error. 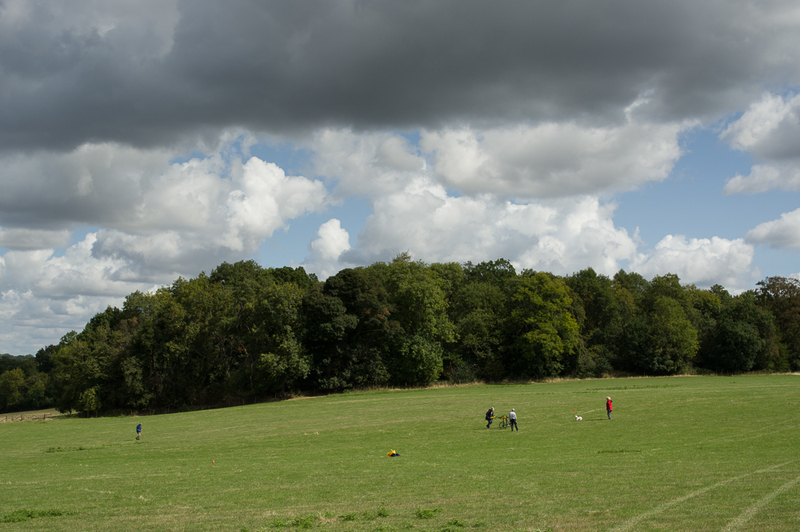 This end of the field is know to contain two Romano-Celtic temples. These are known from aerial photographs taken in the hot summer of 1976. 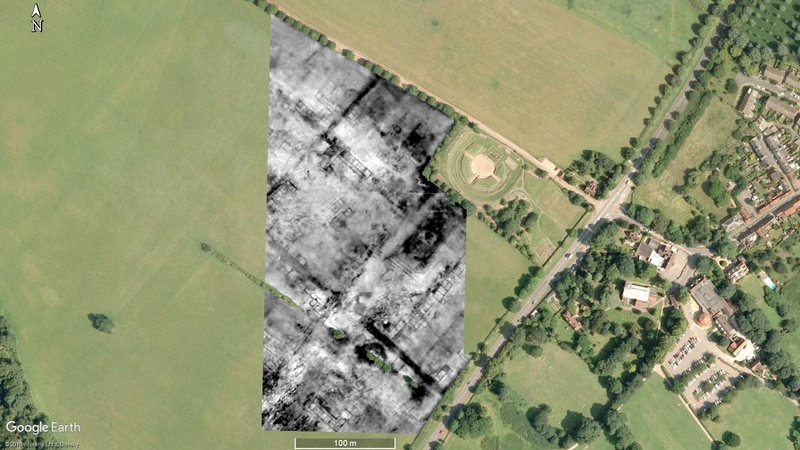 I wonder if this area of the town was kept clear of encroaching buildings, pits, ditches and the like deliberately? 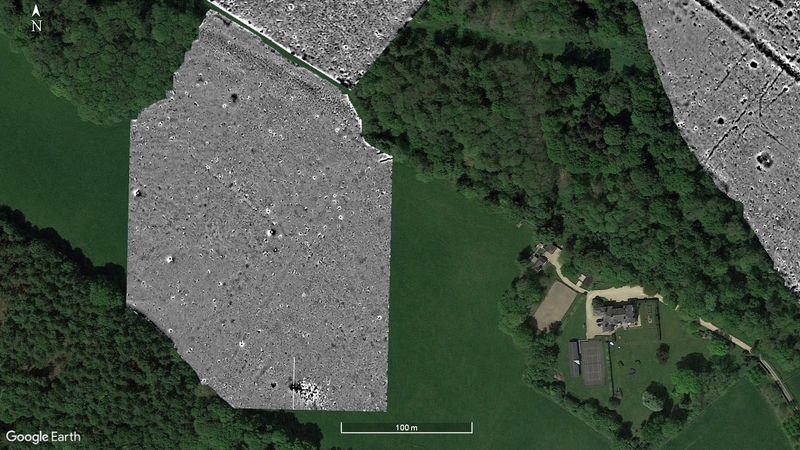 If we turn the contrast down (i.e., clip the image at +/- 40nT instead of +/- 7.5nT, we can see one of the temples close to the hedge as a faint white line. 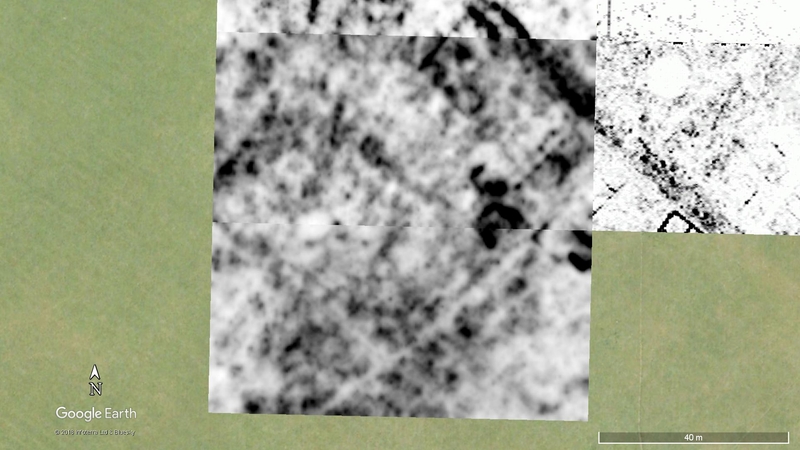 Low contrast version of the area surveyed on day 37. Yet another target for the GPR next year! It is a pretty good result. There is almost no use of the “edge match” feature of the software to get the various grids to join neatly. It could be improved. 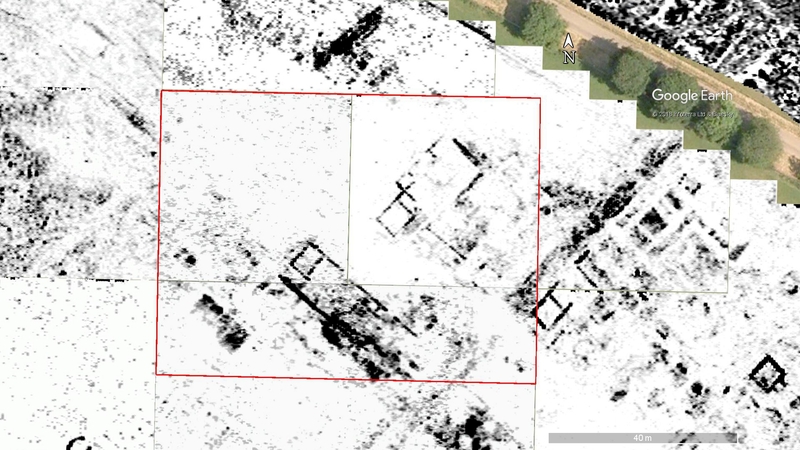 The very high contrast of the temple rather makes the buildings faint, but either the creation of selective composites (i.e., processing bit of the survey separately), or use of a high pass filter, would improve that. 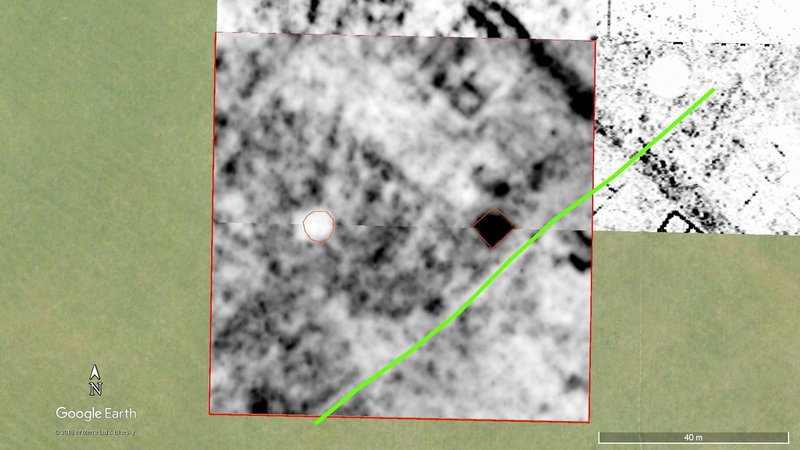 The survey is quite big for a res survey: 2.5739ha according to TS (or 2.6ha to sane people who round numbers), which equals about 103,000 resistance readings. 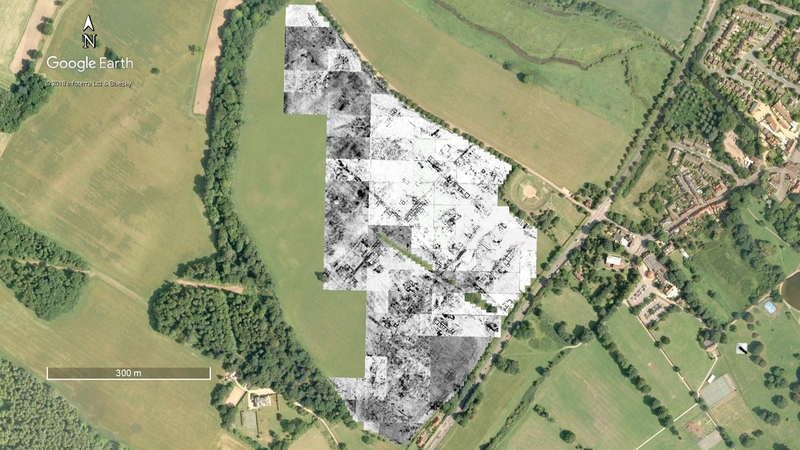 That, of course, doesn’t include the large numbers of squares we re-did due to the dry conditions. There is a great deal more to do in terms of data processing and interpretation, but I think we all deserve a well-earned rest. Well, at least until Thursday…! 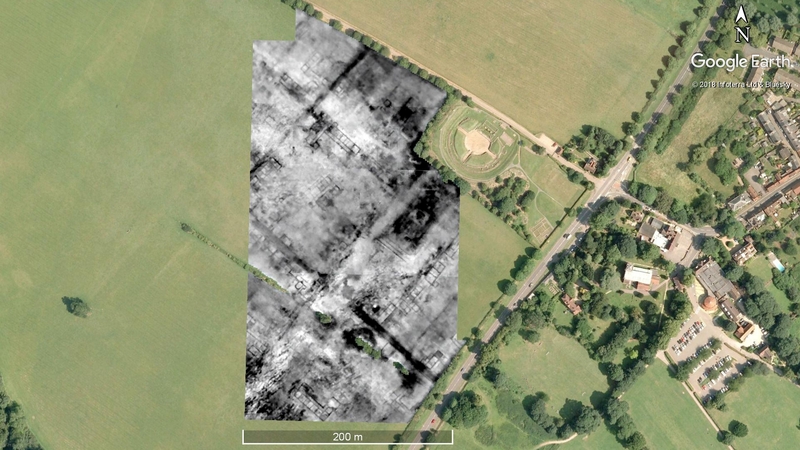 This entry was posted in Verulamium and tagged ahrc, archaeology, Arts and Humanties Research Council, CAGG, community archaeology, earth resistance survey, geophysical survey, Gorhambury, GPR, Hertfordshire, magnetometer, magnetometry survey, resistance, Roman, Roman town, St Albans, ucl, Verulamium on August 30, 2016 by hertsgeosurvey. 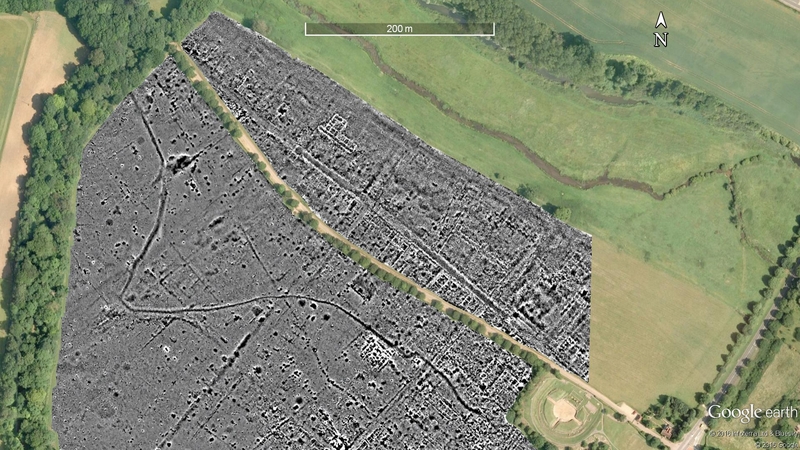 I haven’t managed a Verulamium post for a few days so here is a quick catch-up. 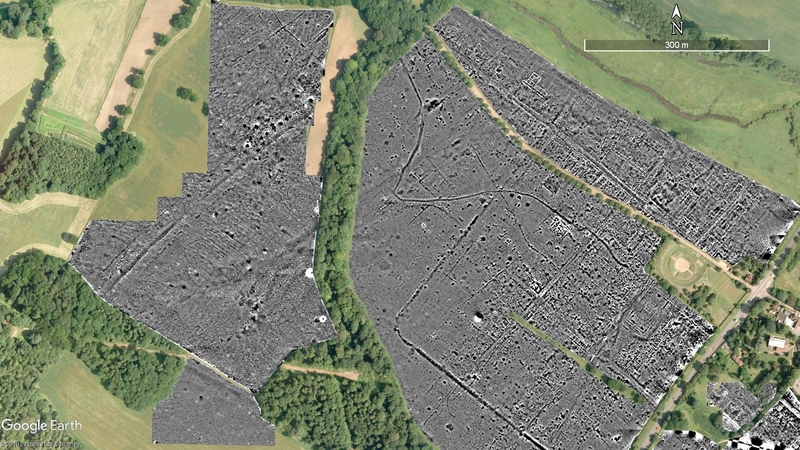 Firstly, the mag has been slowly working its way eastwards along the Macellum Field. They are getting pretty close to the end of it. The mag survey in the Macellum field after day 35. As can be seen, Watling Street stands out very clearly running from near the theatre to the Chester Gate. There are lots of buildings along the road as would be expected. 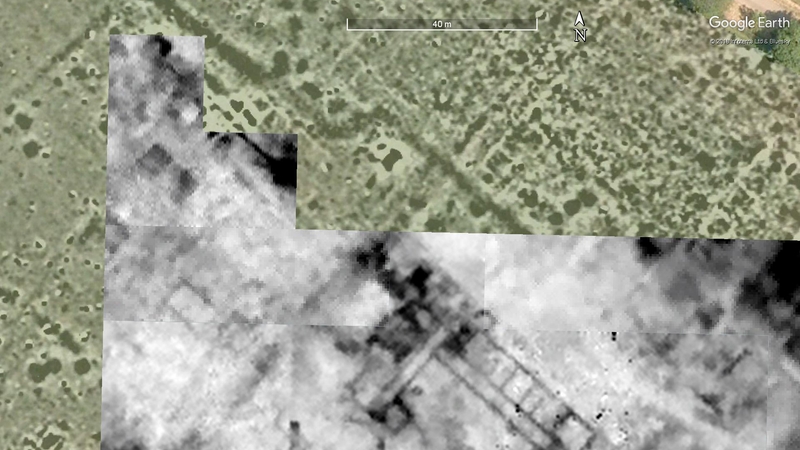 Some are less clear than one would hope because they have been partially excavated. The spec-ally look to the data, almost certainly because of the gravel subsoil, does make it harder to see what is going on here. 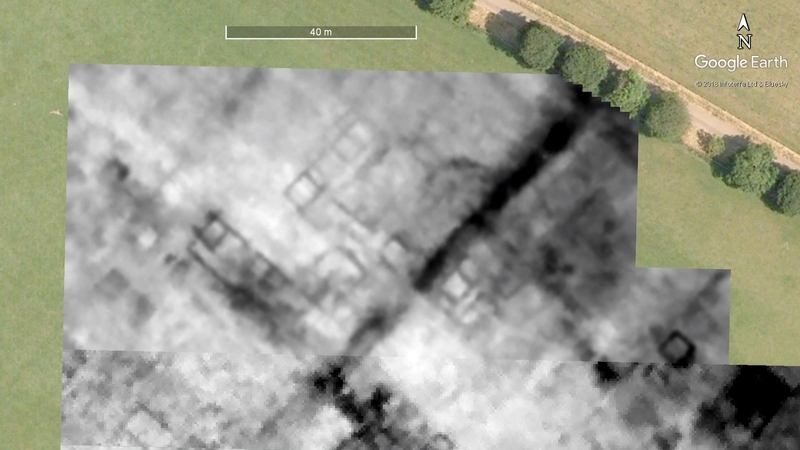 The carrot at the end of the stick — apart from just finishing the field of course — is that there are two Romano-Celtic temples known from aerial photographs near the modern road. 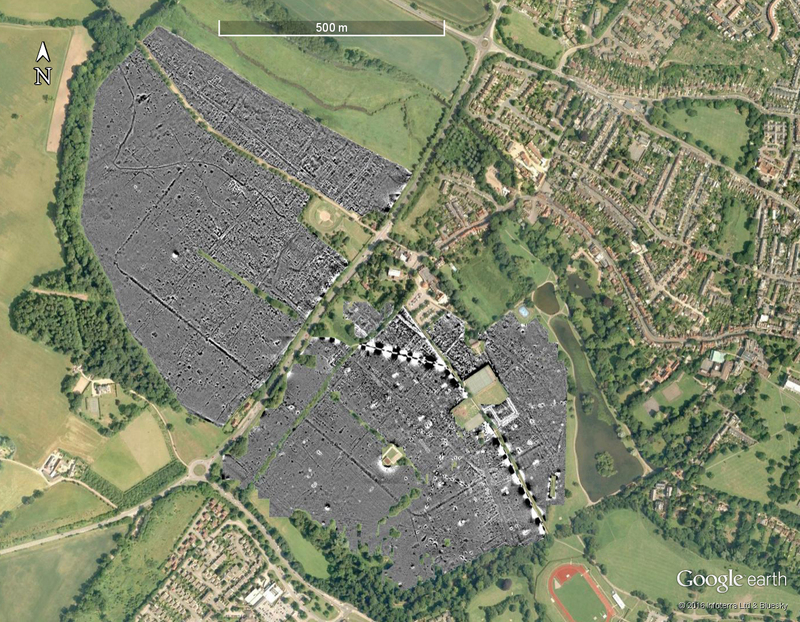 The next image is just to show how much of Verulamium we have now completed. Poster, anyone? The complete survey so far. The resistance survey has had a few problems. The lack of rain has made the top-surface of the field very dry and hard. It is very slow going, and the data is not as clean as one would like. Despite the problems, however, some of the buildings along the road, especially at the north side of the plot, are very clear indeed. The resistance survey after day 35. 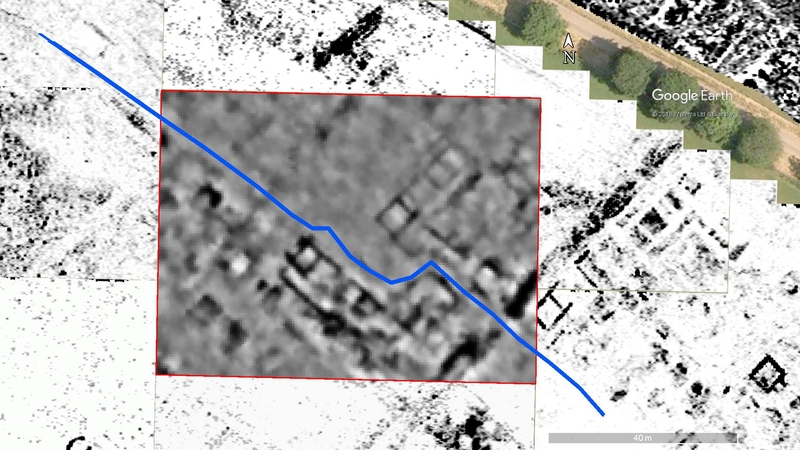 Although it doesn’t jump out at one when just looking at the plot, the sinuous ditch does show in the resistance data when one knows where to look! 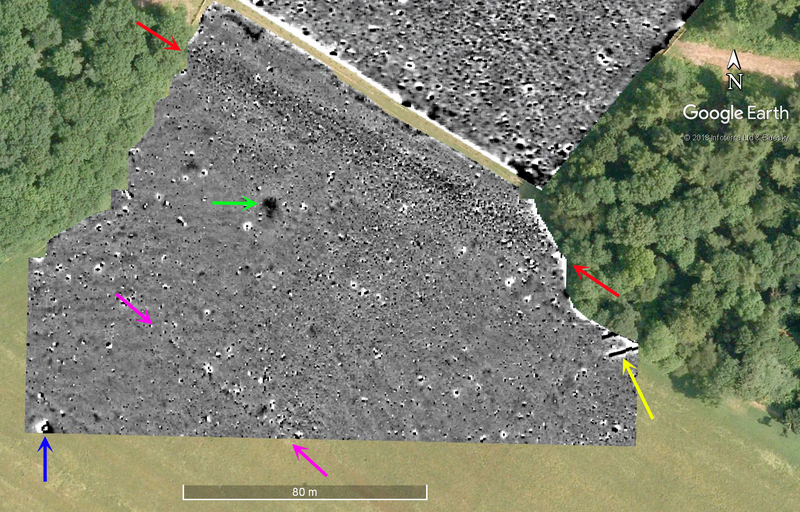 The GPR team completed some blocks along the hedgeline which I haven’t processed yet… sorry! 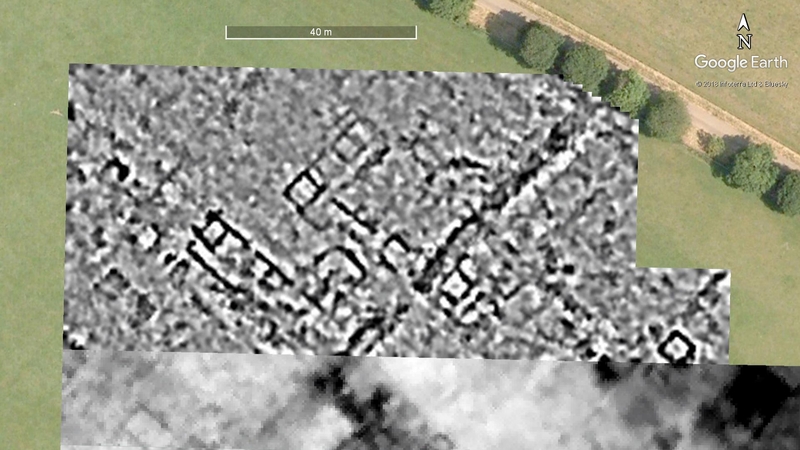 They also did one block up next to the Chester Gate to investigate the building here, and one over the sinuous ditch. The latter did show the ditch but very little else. Let’s look at the block near the Chester Gate. 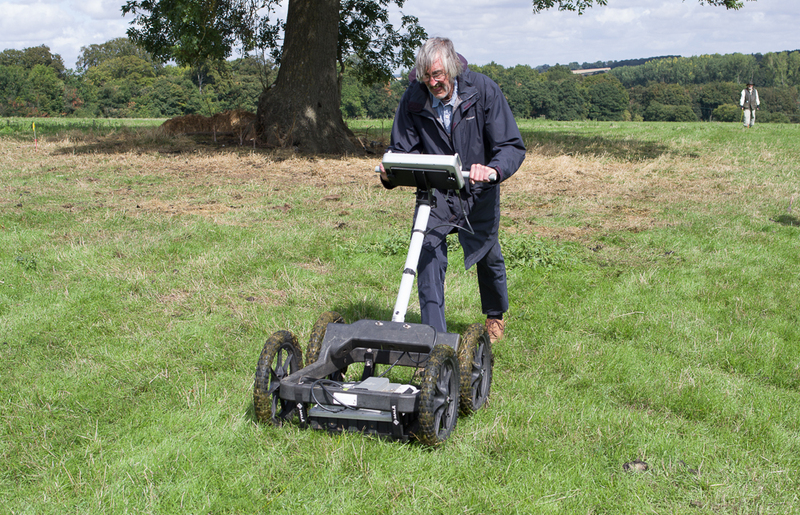 The mag survey near the Chester Gate. 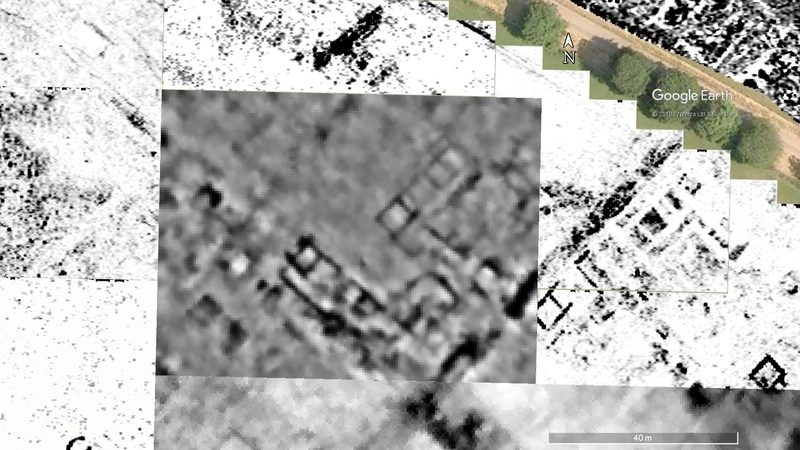 This first image shows the mag data. 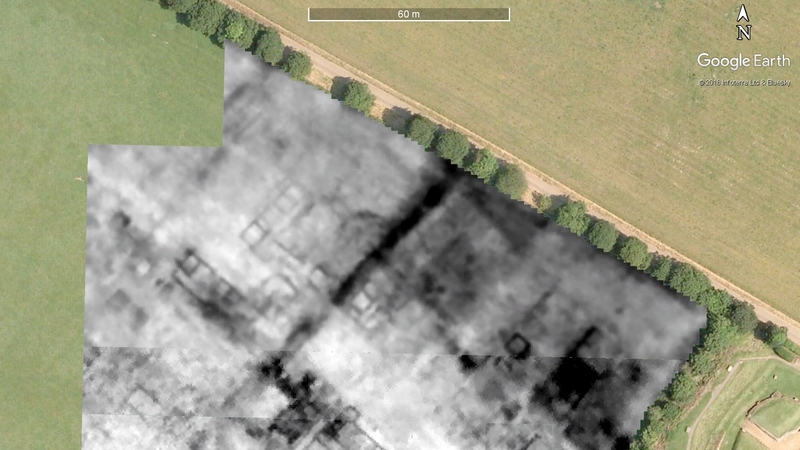 The building in the middle shows as white lines roughly parallel to the modern drive. 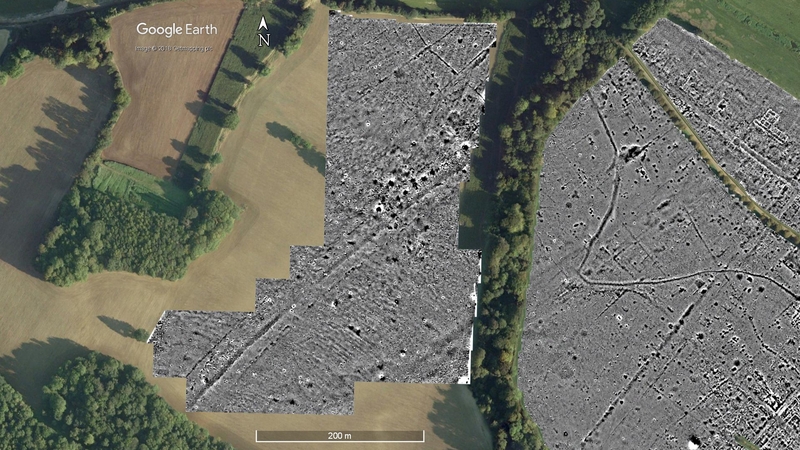 There are lots of other darker features, probably various pits and the sinuous ditch shows to the west. Day 35 GPR, slice 2 (9.5 to 12.5ns). 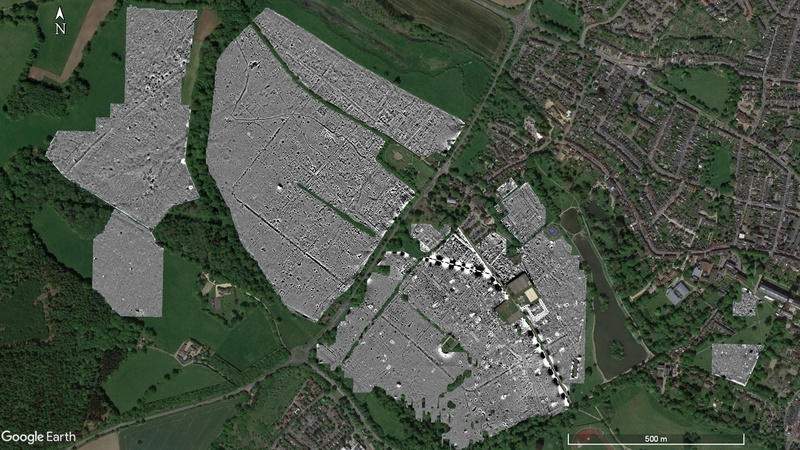 This time slice shows the impact of splitting the survey over two days! The left hand side was done yesterday afternoon, the right hand side this morning. The pattern of the ploughing and the tractor’s turning circle in the corner of the field show clearly. Luckily, the problem is much less acute at lower depths. Day 35 GPR, slice 3 (12.5 to 15.5ns). This time slice now shows the building beautifully. What a wonky end wall on the north side! 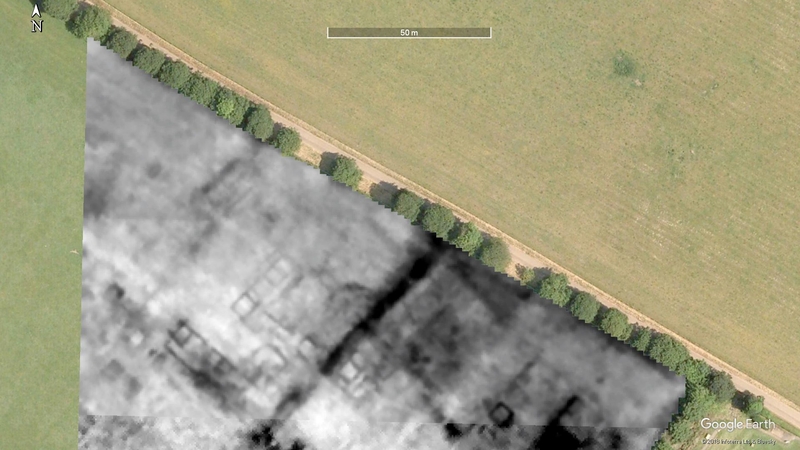 There is a long narrow range of rooms to the SW.
Day 35 GPR, slice 4 (15.5 to 18.5ns). 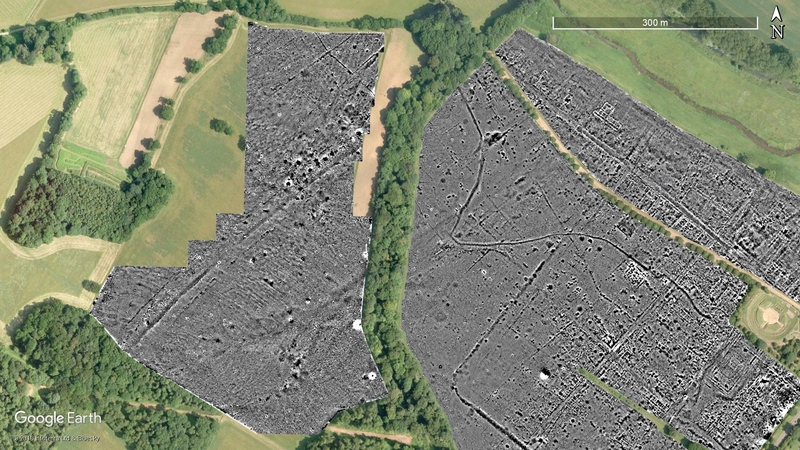 This time slice shows the SW line of rooms more clearly, although at the southern end they are been partly destroyed. 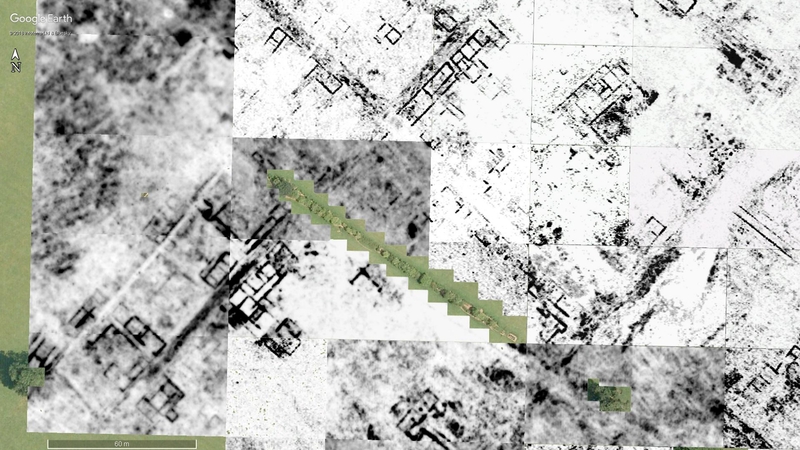 We can see, however, fainter traces of the walls on the NE, a corridor, perhaps? Day 35 GPR, slice 5 (18.5 to 21.5ns). This time slice does show the “corridor” to the NE much more clearly. 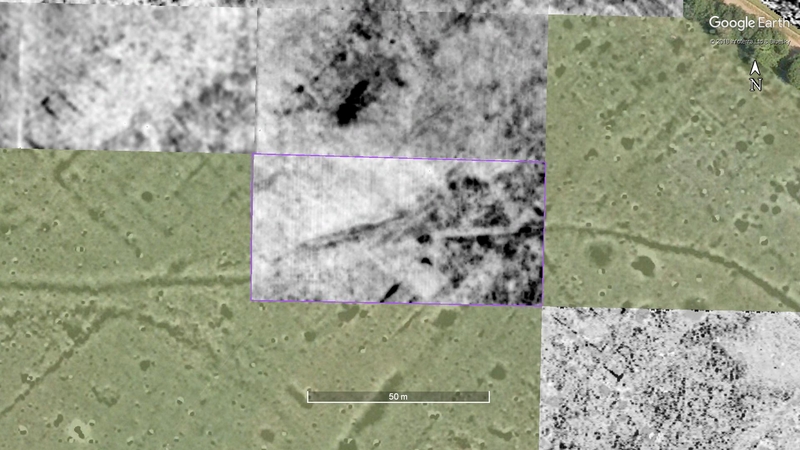 Perhaps it is more deeply buried in the plough bank? For most of the plot, though, nothing much else is showing. There has been a little rain this evening. I have my fingers crossed for more. Hopefully, tomorrow will be dry so that the mag can plough on eastwards! As always, many thanks to everyone, especially those working with the res meter. It is slow and boring at the best of times, but slow+annoying is a great deal to ask. 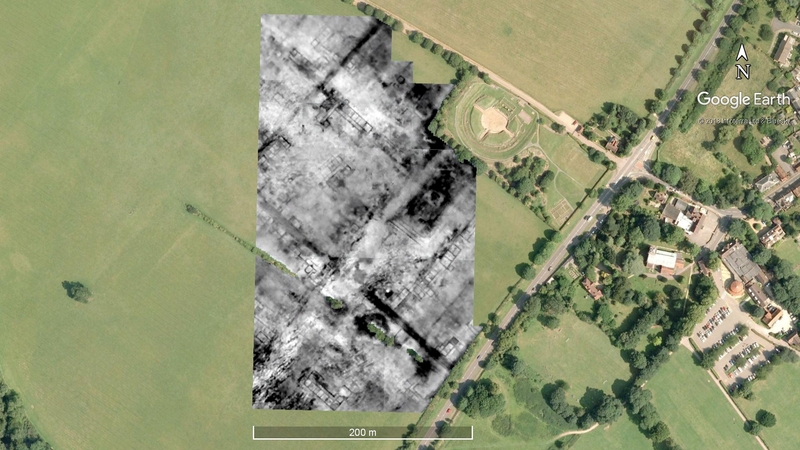 This entry was posted in Verulamium and tagged ahrc, CAGG, earth resistance survey, geophysical survey, Gorhambury, GPR, Ground Penetrating Radar, Hertfordshire, magnetometry, magnetometry survey, resistance, Roman, Roman town, St Albans, ucl, urban, urbanism, Verulamium, Watling Street on August 27, 2016 by hertsgeosurvey.